In a recent blog post, https://gotoguy.blog/2017/02/17/assign-ems-license-with-azure-ad-v2-powershell-and-dynamic-groups/, I wrote about how to use extension attributes in local Active Directory and Azure AD, for the purpose of using these extension attributes for determine membership i Azure AD Dynamic Groups. In the process of investigating my Azure AD users (synchronized and cloud based), I wanted to see how I could use Azure AD v2 PowerShell CmdLets for querying and updating these extension attributes. This blog post is a summary of tips and commands, and also some curious things I found. There is a link to a Gist with all the PowerShell Commands at the end of the blog post if you prefer to skip to that. In the above linked blog post, I wrote about using the msDS_cloudExtensionAttribute1 and 2 for assigning licenses, so I see those values and more. So to some curios things I found. As explained in the blog post https://gotoguy.blog/2017/02/17/assign-ems-license-with-azure-ad-v2-powershell-and-dynamic-groups/, if you are running a Hybrid Exchange organization you would probably use extensionAttribute1..15 instead of the msDS_cloudExtensionAttribute. 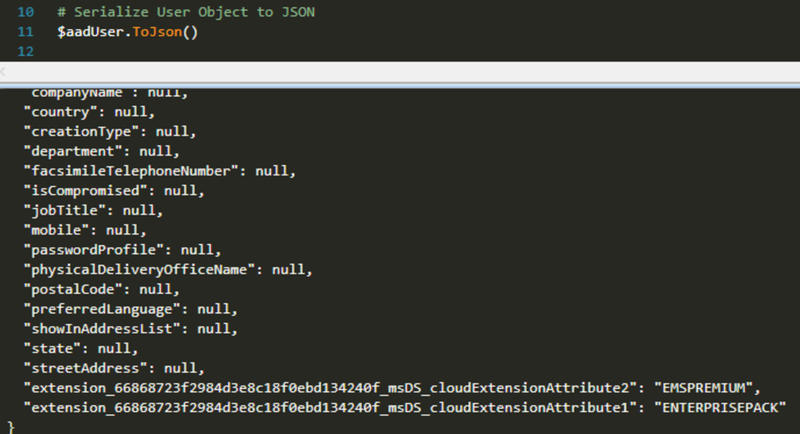 In another Azure AD tenant I tested on that, but using the commands above I never could list out the extensionAttribute1..15 on my users. I never found a way to validate and check those values, but if I created a Dynamic Group using for example extensionAttribute1 or 2, members would be populated! So it was obvious that the value was there, I just can’t find a way to check it. I can see my extension value. However, if I try: https://graph.microsoft.com/v1.0/users/<userid or upn>?$select=extensionAttribute2, I cannot see the value even I know it’s there. Strange thing, hopefully I will find out some more on this, and please comment if you have any ideas. I will also ask this from the Azure AD team. This entry was posted in Azure AD, Azure AD Premium, PowerShell and tagged Azure AD, Graph API, PowerShell on February 18, 2017 by Jan Vidar Elven. Can we get other attributes like ipPhone? Very good article ! I was trying to find a way of filtering a Dynamic Group based on msExchRecipientTypeDetails and tried user.extension_[GUID]__[Attribute] with the ID of MS Exchange Online but it gives me an error … Did you find more about that ? Thanks !